My refrigerator door won’t shut or close. I thought an item in the refrigerator was blocking the door from closing but there is nothing in the way. The refrigerator door itself will not close and stay shut no matter what I try. I am not sure if the seal around the door is bad or if something else is wrong. My fridge is an LG Refrigerator and is about 4 years old. How do you fix a refrigerator door that will not stay shut or close? How To Fix A Refrigerator Door That Will Not Close Properly? – The Refrigerator is not level (leaning forward) and therefore causing the door to not be able to shut. – Food items or shelving in the door are misaligned and blocking the door from shutting. – The refrigerator door hinge is loose and therefore causing the door to not close or shut properly. Note: These methods can also be used for a Freezer Door. 1 – Make sure to clean the refrigerator door seal so there is no food particles on it that can prevent the door from shutting. Use warm water and a clean wash rag to remove any food particles that may be on your door gasket. 2 – Be sure the door seal is installed properly on the door. Make sure the door seal is not falling off or loose. Check all sections of the door gasket to be sure there is not an issue at the bottom or the sides. 3 – Make sure the refrigerator door seal is not damaged in any way… check for rips, tears, and missing or brittle sections of the door seal. If the rubber gasket material gets hard or brittle, the door may have trouble staying closed. Be sure the door seal is in good condition all the way around the door. 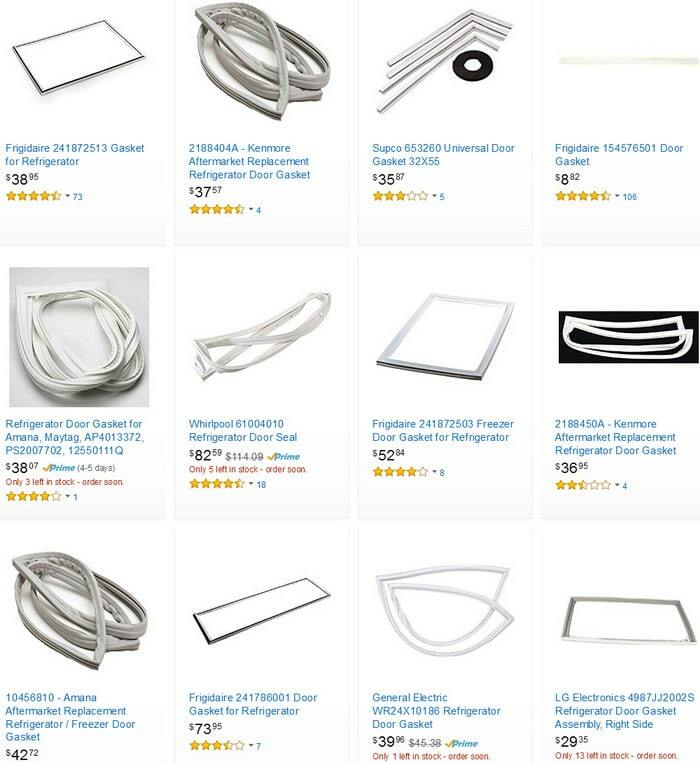 How To Remove And Replace A Refrigerator Door Gasket? Checking or Replacing The Refrigerator Door Gasket: Move the door seal to the side and you’ll see small screws all around the door holding the door seal in place. Be sure none of these screws are loose and therefore sticking out and causing the door to not close properly and not sealing. If you happen to need to replace the refrigerator door gasket, removing these screws will take the gasket off. Installing a new door gasket is as simple as putting it in place and reinstalling the screws tight and flush. NOTE: Some refrigerators do not have screws that secure the gasket and the inner door panel to the outer door panel. Some refrigerators do and some models do not. The video above shows a refrigerator door gasket without screws. 5 – Check inside the refrigerator door to be sure there are no shelves that are misaligned and causing the door to not close. If you find this to be the case, simply realign or reattach the shelving in the fridge door and the door should now close and stay shut. 6 – Be sure the refrigerator is level from side-to-side and front to back. If the refrigerator is not level, the door may be unable to close properly. Many times a refrigerator door will not close properly because the fridge is “leaning forward” and the door is being pulled outward. Leveling the fridge will fix this problem. Put a level on top of the refrigerator and move the legs on the bottom of the refrigerator to level it out. 7 – Check to make sure the hinges on your refrigerator door are tight and not loose. If you have loose screws in the refrigerator door hinges, chances are the door is loose and “leaning downward” and therefore the door cannot close as it is not aligned to the frame of the refrigerator. Slightly lift up on the end of the refrigerator door to be level with the fridge frame and then tighten up the screws on the door hinges. 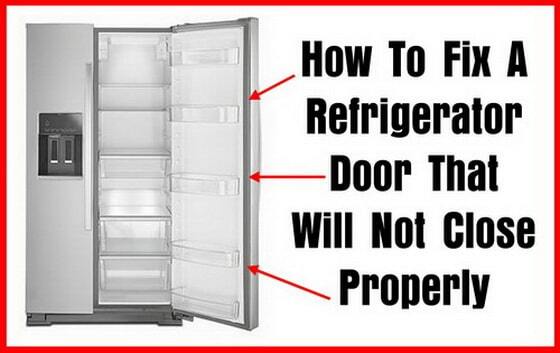 Need help fixing your refrigerator door? Let us know your issue by leaving a question below and we will be happy to assist. I have an LG side by side refrigerator (model # LSXS26326S) that i replaced the refer door gasket on. I replaced the original gasket because it wasn’t sealing from about midway up the opening (left) side to the bottom left. It seals everywhere else but there. Having the same problem with the new one, so its obviously something else. The cabinet is level side to side front to back. I am having the exact same issue! Same brand of refrigerator, same location, same issue. Did you figure out what was wrong? Previous post: Fireplace Fills House With Smoke – What To Check?